In the late 1990s, just ahead of the bursting of the NASDAQ bubble, I reproduced, courtesy of the late Peter Bernstein (author of Against the Gods), a table showing how many quarters of previous capital appreciation were given back in the 12 largest US bear markets since 1929. As can be seen in the table , on average, bear markets gave back 21 quarters, or a little more than five years, of previous capital gains, while the worst bear market (1929-1932) gave back over 15 years of previous gains. 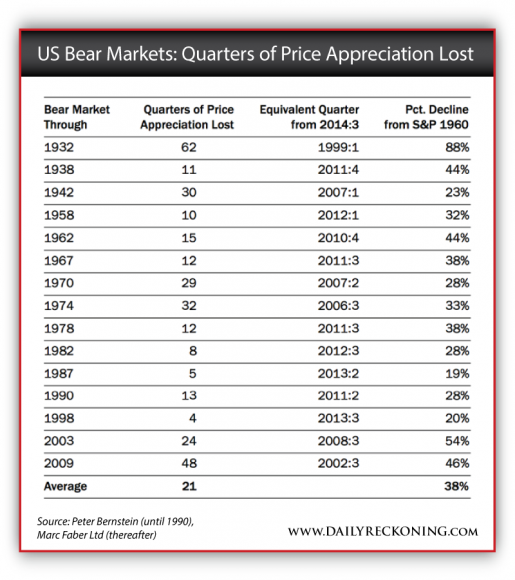 Assuming the S&P 500 were to peak out now and lose the smallest number of previous “quarters of price appreciation lost” (four quarters in the bear market ending in 1998), it would drop to the level in the third quarter of 2013 (down 20%). But this is not so relevant, since everyone seems to be convinced that the US stock market will keep on rising. Therefore, let us also be bullish and assume that the S&P 500 will soar by 30% to 2,570 within a year and then retreat by 21 quarters of previous price gains (the average number of quarters of price appreciation lost since the bear market of 1929-1932). In this case, the S&P 500 would drop following its high, from 2,570 in the second quarter of 2015 to the second quarter of 2010, or to less than 1,200, a loss of 38% from the current level of 1967 for the S&P 500, and of more than 50% from the 2015 high at 2,570. However, not to worry. 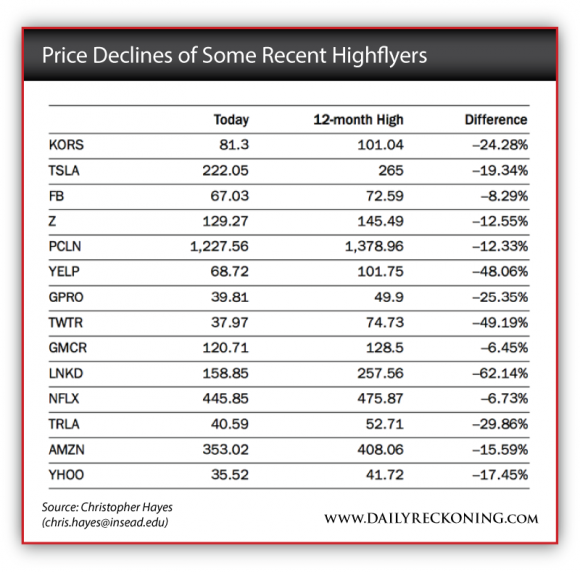 I further need to point out that the stock market has become rather selective and that numerous “popular” stocks are already down meaningfully from their 12-month highs. My friend Christopher Hayes has compiled a table showing some of the carnage that has already occurred. So, whichever way I slice it, I believe that the risks of buying US stocks outweigh the potential of future returns. While it is correct that stocks may move higher, that doesn’t imply that they are attractive. Moreover, propelling stocks to around 4,000 for the S&P 500 would not require “a high degree of monetary policy accommodation” (Yellen), but rather a huge increase in the rate of asset purchases. Under this scenario, it is likely that the US dollar would collapse (as well as the US dollar bond market), creating a global systemic crisis from which the price of precious metals would benefit. I say this because a sharply declining dollar would force other central bankers around the world also to print massive amounts of money in order for their economies to stay competitive. Consequently, the only “cash” that would still have the quality of being a “store of value” would be precious metals. Editors’sNote: Dr. Faber himself is still accumulating gold at current prices. If you’d like to do the same, we highly recommend you contact Neptune Global and speak with a bullion specialist. This entry was posted in news and tagged bear market, daily reckoning, marc faber on August 6, 2014 by Site Admin.